What age division should my child be in? Kids from ages 5 to 14 years old play in one of five divisions. Sign-ups for the spring season begin in late fall, and early registration closes in early December. Subject to space availability, registration continues into January, although some age divisions fill quickly. Player evaluations are held in January, and players are assigned to teams by the beginning of February. Practices begin in early to mid-February. The season begins in early to mid-March (usually the first Saturday) and runs through end of May. Playoffs start in mid-May. Cheviot Hills Pony Baseball Association plays its games at Cheviot Hills Recreation Center on Motor Avenue in West Los Angeles. Pony Division teams (13-14 year olds) also play some of their games at Palisades Park, John Adams Middle School (JAMS), and other partner league facilities. Until the season starts, practices are held twice a week and typically run 1 - 2 hours each, depending on the division. During the regular season, teams play two games per week (usually one Saturday game and one weekday early evening game) and practice once a week, sometimes scheduling batting practice as well. Do the kids really pitch? Yes, kids pitch in all games starting in the Pinto Division - and they love it! Pony baseball encourages kids to learn and enjoy the full baseball experience, while implementing rules that limit how much and how often a kid can pitch to protect their growing arms. What equipment do you recommend for players? This is an all volunteer league. It only runs as smoothly as possible when we have all the wonderful families help lend a hand. Not only are you contributing to a positive baseball experience for the kids, you just may have fun doing it as well! Help start everything off right with a yummy pancake breakfast. Our friends at Bennett's Ice Cream will be manning the griddle and serving up pancakes, hot coffee, and OJ. You can get a full meal for $5 or just a drink for $1. The breakfast opens at 7:45am and will run until the Opening Ceremonies start. All food and beverage are cash only so please plan ahead. For the second year in a row, we will be hosting a CHPBA BBQ starting at 11:30am through 1:30pm. Our volunteers will be hard at work flipping burgers and dogs, filling orders so you can enjoy your full day at the park.This will be a cash only service. Our sponsors will be out in full force to help us celebrate the opening of our season. Many will have booths or trucks present. In addition, some local businesses will be setting up around the park to provide food and fun games. Make a fixed donation - Fixed donations are usually collected at the time of pledge and turned in at the event. Make a "per foot" donation - The child you sponsor will participate in the Hit-a-Thon event, where they will be given 3 opportunities to hit the ball from a tee as far as possible. The longest distance will be recorded and a PayPal request will be emailed to you for the per foot amount multiplied by the recorded distance. Cheviot Hills Pony Baseball Association is a 501(3)(c), so all donations may be tax-deductible. Only a certified tax-professional can give specific tax advice. We encourage you to consult with such a consultant regarding your donation. Yes. On the pledge form please provide an email address where you can receive a PayPal request. We will email you a request for your pledged donation total. To be counted in the child's fundraising total, all payments must be received no later than 2 weeks from the event date. How are the All Star Teams selected? Teams are chosen from the top players in the spring season. Specifics are outlined in the CHPBA All Star Policy. Teams play tournaments across the Southern California area between Memorial Day and September. Pony National Tournament Rules and Affidavit? The following rule books provide the 2013 rules for the Pony National Tournament. CHPBA offers two different fall ball programs: (i) Instructional Fall Ball and (ii) All-Star Fall Ball. Instructional Fall Ball is open to all players. All-Star Fall Ball is open only to those players who have participated in the immediately preceding CHPBA Summer All-Star Program. Fall Ball games are played at Cheviot Hills and other league facilities in the area. The focus of this program is player development in a less competitive environment, teaching fundamentals and introducing and instilling interest in the game of baseball. No standings are kept and there are no playoffs. For Fall 2015, we are planning to offer Fall Ball to all divisions, including Shetland (ages 5 and 6). However, in order to field a team, we need a minimum of 9 registered players. Registration is open to all players, and we do our best to accommodate player requests (e.g., to be on a particular coach's team or to be on the same team as another friend, etc.). Jerseys and caps will be provided as a part of the Instructional Fall Ball registration fee. Teams will be formed in late-August, early-September, with games starting in mid- to late-September and running through late-November, early-December. All practices will be at Cheviot Hills. There will generally be one weekday practice. Games will be played mostly on Sundays. 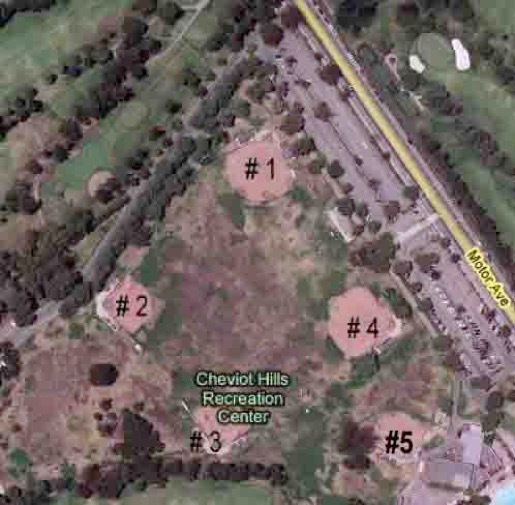 Teams will play games at Cheviot Hills, as well as at neighboring league fields in the West LA area (e.g., North Venice Little League, West LA/Bad News Bears Field, Pan Pacific Park, Santa Monica Little League, etc.). Shetland games will NOT be held in Manhattan Beach as previously advised, but instead at fields in the nearby area. Instructional Fall Ball registration refunds are permitted within 30 days of payment as long as the player has not been placed on a team. Once players have been placed on a roster, there are no refunds. The CHPBA All Star Fall Ball Program is available to existing CHPBA summer all star teams. Such existing teams may request entry into the CHPBA All Star Fall Ball Program (any such team, an "All Star Fall Ball Team"). The manager of each All Star Fall Ball Team shall be subject to the approval of the Fall Ball Committee, taking into consideration prior coaching experience, parent evaluations of the manager and other relevant factors. Each All Star Fall Ball Team will be "age based" (e.g., 9U, 10U, 11U, 12U, 13U, etc.) as opposed to "division-wide" (Mustang, Bronco, etc.) unless otherwise approved by the Fall Ball Committee. An All Star Fall Ball Team will be considered full if all existing players on the applicable existing CHPBA summer all star team are rostered on such All Star Fall Ball Team or such All Star Fall Ball Team is comprised of at least 12 players (although such All Star Fall Ball Team, subject to the approval of the Fall Ball Committee, may carry less than 12 players). NOTE: THESE TEAMS ARE BEING FORMED ONLY FOR THE FALL SEASON AND WILL NOT BE ALLOWED TO STAY TOGETHER AS A TEAM DURING THE REGULAR SPRING SEASON, AS SPRING SEASON TEAMS ARE FORMED PURSUANT TO A DRAFT FORMAT. For more information on CHPBA's All Star Fall Ball Program, please click here and view All-Star folder. ALL DIVISIONS: 2-3/4" barrel bats are now illegal. Youth Big Barrel (2-5/8) are not affected by this change. ALL DIVISIONS: If a player uses a small barrel bat - 2-1/4" barrel - it must be stamped with the following 3 pieces of information (1) “approved for play in PONY Baseball” (2) “BPF 1.15” and (3) the year the bat was manufactured. BRONCO and PONY DIVISIONS: If a player uses a youth caliber bat - a 2-5/8" barrel bat with a lighter weight (usually a -7 through -10 weight, if you can find it) - it does not have to be BBCOR certified. This means that 2-5/8" barrel youth bats that have been purchased over the past few years are all still legal and can be used. PONY DIVISION (and any player in any division using this kind of bat): If a player uses a high school caliber bat - a 2-5/8' barrel bat with a (-3) weight - the bat must be BBCOR certified (with a length to weight difference of 0.50) and bear a stamp on the bat with that certification.